Does Coat of Arms benefit my opponent as well? That's pretty much the case, yes. I can give out a few options that I find good, but playtesting as well as local meta should be the deciding factors. Collective Brutality is great because it's both good against burn, some other aggro decks, and most two card combo decks. It's very versatile. Surgical Extraction , Leyline of the Void , and Nihil Spellbomb are all good options for graveyard decks, the latter of which is very inexpensive. Creeping Corrosion and Fracturing Gust are great against artifact decks. Duress and Negate are not only basically free, but they are also good against both control, and combo decks. Fulminator Mage is good against land-based decks, control, and decks with steep curves. 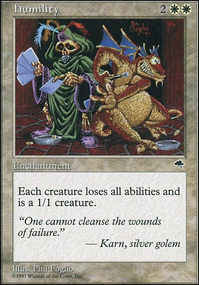 Damnation is good against tribal decks, and so is Mutilate , which, while not as potent can give you a chance of keeping around your own creatures and it's dirt cheap too. Night of Souls' Betrayal is awesome against decks with a lot of 1 toughness creatures, and it's also quite cheap these days. It used to be a $20 card. It could be an idea to pick up soon in case it's price shoots up again. Hey everyone. Working on tweaking my modern deck Modern 8-Rack to make it a bit more efficient. I know the sideboard needs alot of work, and have ideas for that but mostly they're cards I still have to aquire. Recently I started noticing issues within the mainboard that I'm hoping to resolve. Namely that with 7 lands that require Urborg, Tomb of Yawgmoth to tap for black I'm frequently screwed for that second black source I need and that my alt win con ( Mutavault ) just doesn't do it, especially as I find myself more and more frequently turtling behind Ensnaring Bridge to survive. I've been hesitating to take mutavault out because otherwise a Chalice of the Void on one literally forces me to concede, but I can't justify keeping it in when I rely so heavily on bridge. In short, it's time to find a new alt win con. With Davriel coming out soon he was among the first cards I considered, but a 3 mana rack that hits for 2 damage isnt worth it in my opinion. 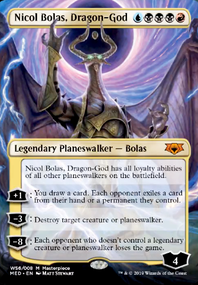 Sure, he comes with a built in discard engine, but if anything I think he's a budget alternative to Liliana of the Veil , not a win con. At the moment the most promising choice I'm seeing is Liliana's Caress , but it scares me because if I dont drop it turn 2 then it doesn't seem like it'll do enough. Once I get their hand empty, most opponents will just cast whatever they top deck rather than be forced to discard it meaning I'll only get triggers on those rare occasions when my opponent's draw a spell they can't cast. Are there any other win cons that work in 8 rack besides running a creature or 2 to beat face in that I'm missing? Amazing deck and presentation! Looks really pleasurable to pilot. I love all the synergies you've built between Haakon and Elenda. 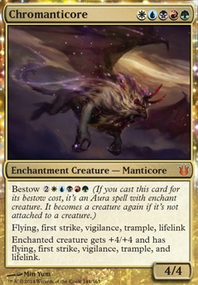 Bitterblossom > not the funniest card you could find, but it is a real powerhouse alongside Attrition , Anointed Procession , Skullclamp , Dictate of Erebos etc. / I was a bit surprised it wasn't included. Enduring Renewal > makes you a bit more vulnerable against control match-ups as they can see and play around what you're trying to do, but it has the potential of being extra spicy there - giving you a lift at building up your combos. Grave Pact / Martyr's Bond > don't know if they are needed (depends a lot on your meta I guess), but their absence is at least just worth mentioning. Academy Rector > absurdly good at tutoring some of your combos. Expensive (money speaking) nonetheless. Ethereal Absolution / Night of Souls' Betrayal / Tainted AEther + Akroan Horse / Infernal Genesis / Alliance of Arms > weird strategy to fuel Elenda. Could create an additionnal effective win con. Forbidden Orchard > fuel for Elenda against creatureless decks. Taps for any color. Grave Betrayal > greedy and expensive card that only works against decks running valuable creatures. Good fun, poor consistency. If your main win-con is RiP plus Helm, and you're not planning on attacking all that much, with Humility in your deck, you could run either Lightmine Field or Night of Souls' Betrayal / Curse of Death's Hold to shut down all creatures. This could be a slick Mono-Black list. Probably a mono-black devotion deck. Gray Merchant of Asphodel , Geralf's Messenger , and Relentless Dead as a mini-zombie theme, Gatekeeper of Malakir , Bloodghast , and Kitesail Freebooter s to finish up the creature-base, with seriously high-value creatures, all of which add to devotion, and the rest of the mainboard can be removal like Fatal Push , Disfigure , Echoing Decay , Go for the Throat , etc. 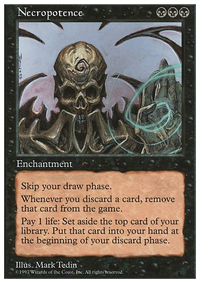 as well as discard in the forms of Thoughtseize and Inquisition of Kozilek . For a price, Liliana of the Veil / Liliana, the Last Hope / Phyrexian Obliterator are all fine inclusions. A sideboard filled with Duress against control (as though they could surive your onslaught of discard and recursive threats in the mainboard), Leyline of the Void against dredge and phoenix, Fulminator Mage against tron, Whip of Erebos for needed midrangy lifegain and recursion shenanigans, and whatever suits your meta, be it Ratchet Bomb against artifacts, tokens, or enchantments you find troublesome, Night of Souls' Betrayal for anti-swarm, Phyrexian Arena / Dark Confidant if you need some more grind, etc.